One of the most important geographical terms is elevation. Elevation describes how high or low a location is in relation to the mean sea level of Earth. It has many different uses, for example in architecture and town planning, and can have a direct influence on an area’s climate, with low elevation spots tending to have warmer temperatures and reduced chance of snowfall. Elevation is typically measured in feet or meters. Most locations have an elevation above sea level, but it is possible for some very low locations to have elevations lower than sea level. Many major American citizens are located near coastal areas, meaning that they have relatively low elevations in general of around 500 feet (152 m) or less, but the United States features a vast array of landscapes, including many mountain ranges, canyons, high plains, and more, resulting in very different elevations from one state to the next. In general, the rule is that as one moves further inland, the average elevation will start to rise. The lowest states, for example, are Delaware, Florida, and Louisiana, which are all located on the coast and have large amounts of low-lying coastline. 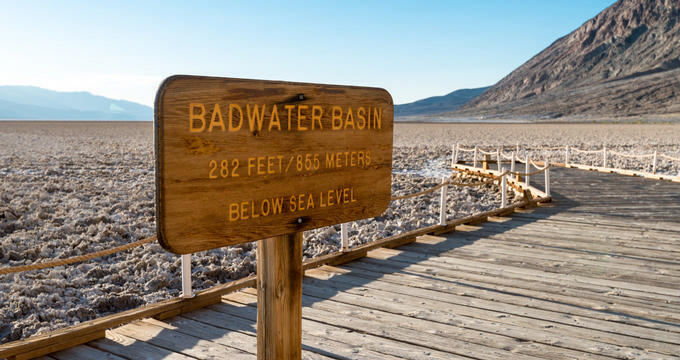 The point with the lowest elevation in the United States is Badwater Basin, which is located in Death Valley, California. Badwater Basin is a large basin that contains some dry and wet areas, with a large pool of extremely salty water in one section. The maximum length of the basin is 7.5 miles (12 km), while its maximum width is 5 miles (8 km). The lowest point is located in the western part of the basin and has an elevation of 279 feet (85 m) below sea level. It's one of the lowest points in the entire world. The lowest point in the world is in the Dead Sea, which has an elevation of 1,391 feet (424 m) below sea level at its lowest point. Badwater Basin is well known for its unique salt flats and their hexagonal honeycomb-style formations. Some plants and animals are able to live in the area, but Badwater Basin is very inhospitable to humans. The water is completely unsafe for consumption due to its high salt content and the flats are dangerous as they are filled with mud. In spite of this, Badwater Basin and Death Valley are still popular touristic spots, offering some truly unique views that cannot be replicated anywhere else on Earth. The lowest city in the United States in terms of elevation is Calipatria, formerly known as Date City, in California. Calipatria is found in Imperial County in the southern part of California and covers an area of just 3.72 square miles. It has a population of around 7,500 people and an elevation of 180 feet (50 m) below sea level. This makes it not only the lowest city in the United States, but also the lowest in the entire western hemisphere. Due to its unique elevation and location, Calipatria has a very hot desert climate with minimal rainfall and high temperatures for almost the entire year. California is also home to the lowest census designated place in the United States. Furnace Creek, which is located in Death Valley, is a very small community in Inyo County. It has a population of barely two dozen people and an elevation of 190 feet (58 m) below sea level. It also has the distinction of being the site of the hottest recorded air temperature on Earth at 134°F (57°C). Despite being the home of many of the lowest points in the United States and western hemisphere, California is not the lowest state of all. Its mean elevation is actually relatively high at 2,900 feet (880 m). The state with the lowest average elevation is Delaware, which has a mean elevation of just 60 feet (20 m) above sea level. The highest point in the state of Delaware is the Ebright Azimuth, which has an elevation of 447 feet (136 m), while its lowest point is at sea level in the Atlantic Ocean. The state with the largest elevation span, which is the difference in elevation between the highest and lowest points in the state, is Alaska. The highest point in Alaska is Denali at 20,310 feet (6,190.5 m), while its lowest point is the waters of the Arctic Ocean and Bering Sea, which are at sea level, giving it a total elevation span of 20,310 feet (6,190.5 m).